Born, educated, worked or died in Hexham, famous and/or notorious? Find them here, sorted alphabetically by surname! Want to know the names of MPs that have served the Hexham Constituency? Some are mentioned below (we leave it to the reader to decide whether they were famous or notorious, or something else), and Wikipedia has a full list. This listing contains many who have only a minimal connection to the town; others, with a greater claim to have contributed to the history of Hexham, can be also found in our book Hexham Lives or in issues of the Hexham Historian (check the HH Index or Contents). Alcock, Rutherford (1809-1897). Diplomat, educated at Hexham Grammar School (not recorded in Wikipedia but stated here). First British Consul-General to live in Japan and the first non-Japanese to climb Mt Fuji. Alcuin (born c732-804). Anglo-Latin poet, educator, and cleric who, as head of the Palatine school established by Charlemagne at Aachen, introduced the traditions of Anglo-Saxon humanism into western Europe. He was the foremost scholar of the revival of learning known as the Carolingian Renaissance. He was responsible for the introduction of the Irish Northumbrian custom of singing the creed. He arranged votive masses for particular days of the week in an order still followed by Catholics, reedited the Latin Vulgate, and wrote a number of works on education, theology, and philosophy. Although he lived largely in York to the age of 50 when he moved to Tours in France, he is thought to have been a monk at Hexham Abbey at some point in his career although there is no evidence for this. Barnsley, Gabriel (1916-86). Novelist and poet under the pen-name Gabriel Fielding. Bastable, Anthony Leslie “Tony” (1944 – 2007). Born in Hexham. Television presenter best known for being one of original presenters of the children’s programme Magpie. Beaufort, Henry 3rd Duke of Somerset (1436-1464). Lancastrian commander at the Battle of Hexham. After the battle he was executed in Hexham’s Market Place and buried at Hexham Abbey. Benson, George Elliott (1862-1902). Soldier. 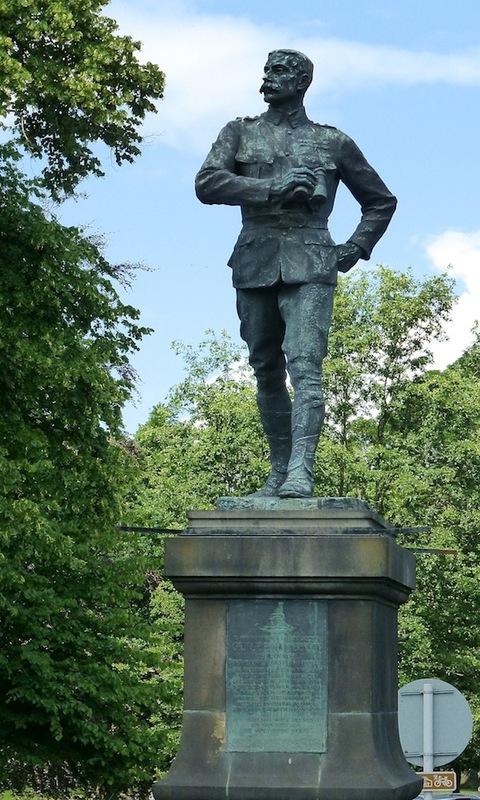 Born at Allerwash and killed at the Battle of Bakenlaagte, his statue stands at the head of Beaumont Street. A commemoration of him can be found in Hexham Historian 24. The Victorian Web (which is where this image is from) contains further details. Brown, Douglas Clifton (1879-1958). Politician. 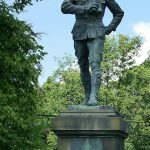 Member of Parliament for Hexham 1918-1958. Elected Speaker of the House of Commons in 1943, he was elevated Viscount Ruffside in 1951. Brown, Glen (b 1966). Artist. Born in Hexham. Cliff, David John “Dave” (b 1944). Jazz guitarist, born in Hexham. Cook, Ann. Innkeeper and cookery writer. The landlady of the “Black Bull” in Hexham’s market place, she wrote “Professed cookery” in 1754, in part a vituperative attack on “The art of cookery” by Hannah Glasse (cf). Doherty, Pete (b 1979). Musician. Born in the Maternity Unit, Hexham General Hospital. His parents were stationed in nearby army base. Dommersen, Pieter Cornelis (1833-1918). Dutch painter and watercolourist. Also known as Dommerhuijzen. 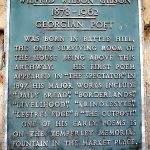 He moved to England in 1855 and died in Hexham. 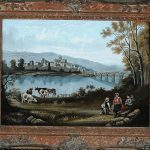 Are there any paintings by him of Hexham or the surrounding area? Donkin, Bryan (1768-1855). Born at Sandhoe. Inventor and manufacturer. Acquired the patent for the tin can from Peter Durand in 1812 for £1000 and opened the first “cannery” to make “Tinned, Iron Containers” within a year. His partners in this venture, Hall & Gamble, founded a company that evolved into Crosse & Blackwell. Donkin went on to invent the Fourdinier, an early machine for making paper, and a printing machine with composition ink rollers considered to be far superior to other machines available at the time. He also made gas valves to such high standards that a “Donkin” is a generic term for gas valves to this day. Bryan Donkin & Co is still an international business manufacturing valves. Elder, Mark Philip (b 1947). Conductor and Musical Director of various British orchestras. Born in Hexham. Ellis, James (c1763-1830). Solicitor and antiquary. Born in Hexham, the son of James Ellis, glover. Fairless, Thomas Kerr (1825-53). Landscape painter, born and died in Hexham after a successful career as a painter in Newcastle and London. 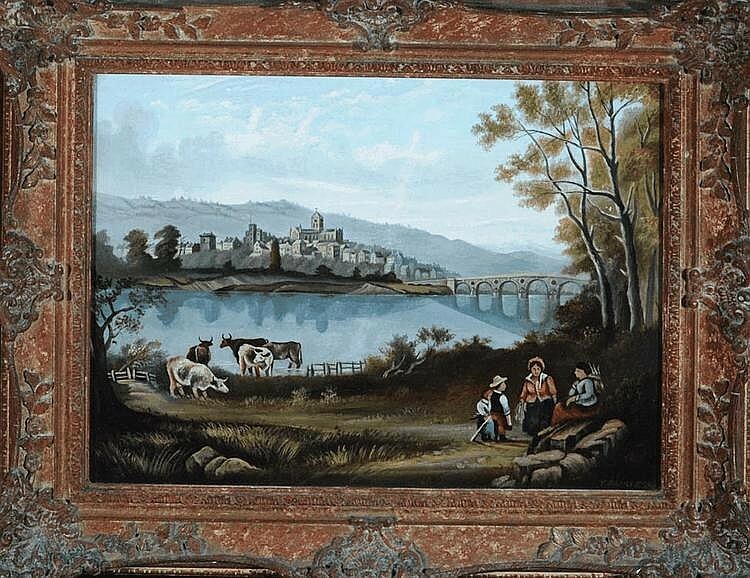 Could this be a painting of Hexham by him? “False Jew of Hexham”. A Scot, Thomas Ramsay, who in 1653 claimed to be Joseph ben Israel, a Jewish convert to Christianity. Exposed as a fraud, thought to be a Catholic plot to discredit the Baptist minister Thomas Tillam (cf). Fielding, Gabriel see Barnsley, Gabriel. Forster, John (c1520-1602). “A godly rogue” Long-serving and devious Warden of the Middle March, 1560-1695. Gibson, Wilfrid Wilson (1878-1962). Poet. Born in Hexham, a friend of Rupert Brooke, he became a member of the Georgian poets. The land of my delight. The land where I would be. 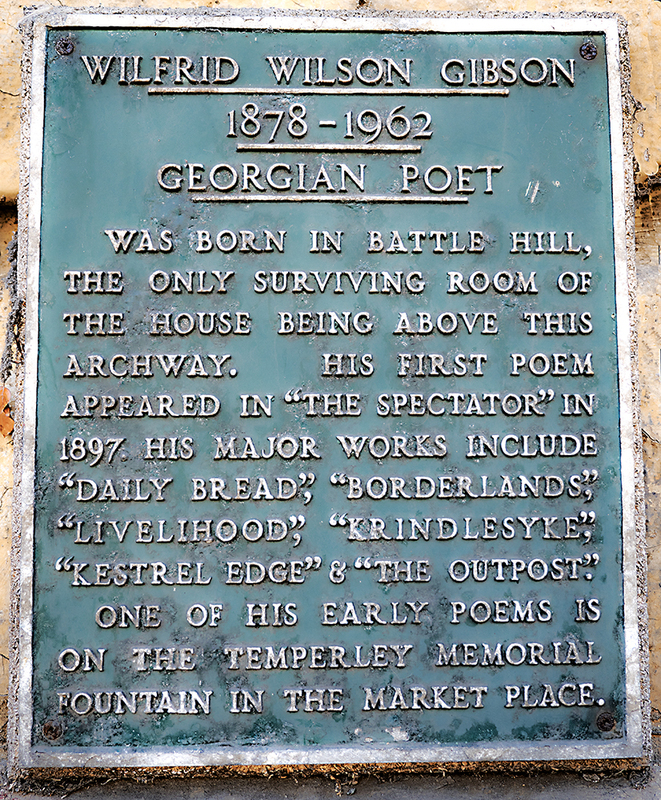 There is a plaque to Gibson in Hexham. 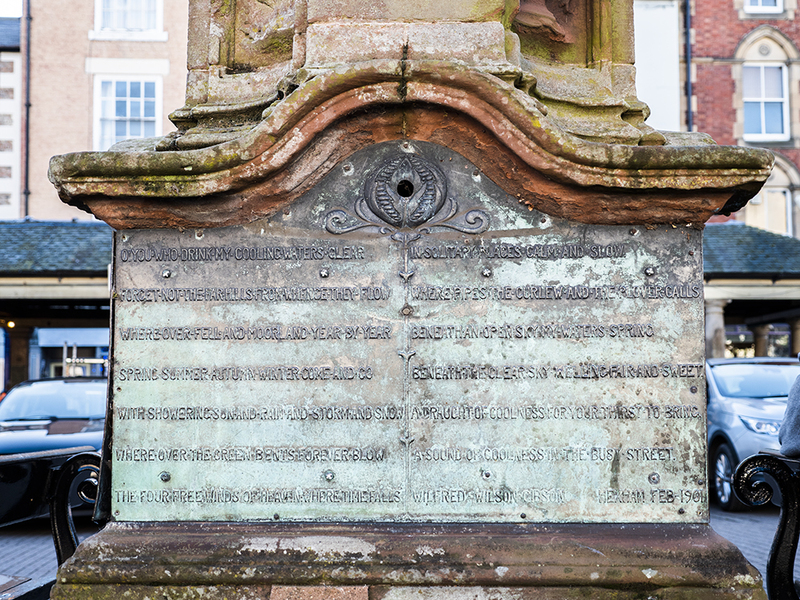 In 1901 one of his poems was inscribed onto the fountain in Hexham Market place (more photos here). A profile of Gibson, by North-East poet Keith Armstrong, can be found in Hexham Historian 28. Glasse, Hannah (1708-70). Cookery writer best known for her book “The art of cookery made plain and easy” published in 1847 and her subsequent feud with Ann Cook (cf). The half-sister of Lancelot Allgood. Graham, John Norman (b 1943). Cricketer. A tall medium-fast right-arm bowler and an absolute tail-ender in terms of batting, he played for Kent during the county’s years of success in the late 1960s and early 1970s. After retirement from first-class cricket, he played Minor Counties cricket for Northumberland. Green, Robson Golightly (b 1964). Actor, singer and television presenter. Born at Dilston Maternity Hospital, Hexham, although he grew up in Dudley, North Tyneside. Hammond, Hermione (1910-2005). Painter most famous for her paintings of London during the Blitz of World War Two. Born in Hexham. Heppell, “Lennie” Leonard (1920-2009). Dancer, nightclub owner and sports coach. Born in Colchester, Essex, he came to the north-east to work as a miner at Acomb Colliery. He and his wife, Molly, who he met in Hexham, became championship ballroom dancers. In 1956 they opened the north-east’s first nightclub, The Fandango, in Hexham. Through his son-in-law, the footballer Bryan “Pop” Robson (cf), he was largely instrumental in introducing the techniques of dance to the sports world; influencing among others, the footballers Peter Shilton, Bobby Moore, and Kevin Keegan, the boxer Frank Bruno, and tennis stars Bjorn Borg and Steffi Graf. Hewson, William (1739-1774). Surgeon and comparative anatomist. “The father of Haematology”. Born in Hexham, he became a protege of Benjamin Franklin. Profiled in Hexham Historian 5. Hextilde of Tynedale (d c1180). Saxon noblewoman, grand-daughter of Waltheof of Tynedale, the last Provost of Hexham. Married to Richard Comyn, Norman follower of King David I of Scotland. Richard and Hextilde granted extensive lands to Hexham Priory; in gratitude, the canons renamed the settlement in her name, Hextildesham. John of Hexham (d 1209). Cleric and historian. Prior of Hexham from c1168, author of A history of twenty-five years (c1162), a continuation of the Historia Regum of Symeon of Durham. Jurin, James (1684-1750). Medical pioneer. Although born in London, Jurin had connections with the North-East through his mother, a member of the Cotesworth family, and married the daughter of a Morpeth MP. Having served as Head Master at Newcastle’s RGS, he later returned to university to study medicine. He developed the theory of smallpox variolation, a precursor to innoculation, some 50 years before Jenner. Jurin purchased the Hermitage, across the river from Hexham, as a country retreat and it remained in the family for a couple of generations. Kidd, James Hutton (1877-1945). New Zealand horticulturist and community leader. Born in Hexham. Moore, Temple (1856-1920). Church architect. Responsible for the design of the new Abbey nave. Oswiu (c610-670) King of Northumbria. Brother of St Oswald, fought at the Battle of Heavenfield and possibly the Hagustald from whom Hexham got its original name of Hagustaldesham. Peel, William (1875-1945). Colonial administrator who became Governor of Hong Kong, 1930-35. Born in Hexham. Richard of Hexham (d c1167). Cleric and historian. 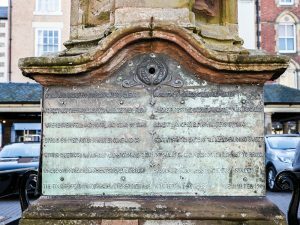 Prior of Hexham from 1141, he is known for his two histories, The deeds of King Stephen and the Battle of the Standard (1138) and The history of the founding of the church of Hexham and of the Bishops of that place (c1154). Richardson, Joseph (1755-1803). Journalist, satirist and playwright. Born in Hexham, he served as the MP for Newport in Cornwall. Co-writer of The Rolliad. Rippon, Geoffrey (1924-97). politician. Conservative Member of Parliament for Hexham, 1966-74, elevated Baron Rippon of Hexham in 1987. Robert of Hexham cleric. Prior of Merton Priory, Surrey, 1238-1248/9. Robson, Bryan Stanley “Pop” (1945-). Footballer. “The best Centre-Forward never to play for England”. Born in Sunderland, he played primarily for Newcastle and West Ham and later as a coach for Carlisle, Chelsea and Sunderland among others. On retirement from football, he moved to Hexham, the home of his wife Maureen and her father, Lennie Heppell (cf), where he ran a newsagent on Hencotes for some years. Robson, Featherstone (1880-1936). Landscape artist. Rubenstein, Helena Cosmetics brand. Lewy (1852-1944) & William Pattinson (b1857), of Pattinson’s Chemists, emigrated to Australia and founded Pattinson & Co, pharmacists. In the early 20th century, Rogena Rubinstein, an employee in their shop in Pitt Street, Sydney, developed her own line in cosmetics, later marketed under the name Helena Rubinstein. This is mentioned in the article on the Pattinson family in Hexham Historian 17; however, it does not tally with the article on the history of the Helena Rubinstein brand on Wikipedia – which is right and which is myth? Savage, Sidney (1862-1947). Cleric. Rector of Hexham Abbey, 1898-1918. Responsible for the rebuilding of the nave, consecrated in 1908. See Canon Sidney Savage: Cleric & man of action, by David Jennings. Wells, Matthew (b 1979). Olympic oarsman. Although born in Bradford, grew up in Hexham and attended Queen Elizabeth High School. Wilfrid (c634-687). Saint and bishop. Founder of Hexham Abbey and, thereby, of the town. Wilson, James. 18th century schoolteacher, poet and songwriter. Four of his rhymes are included in Bell’s Rhymes of the Northern Bards, 1812. Winter, Dagmar (b 1963). Cleric. First female Rector & Lecturer of Hexham Abbey.